The Java EE Architect’s Handbook, Second Edition by architect and consultant Derek C. Ashmore enables aspiring Java developers to gain the knowledge and skills they need to become software architects. 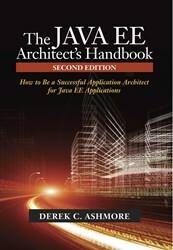 The Java EE Architect’s Handbook, Second Edition, available at dvtpress.com, provides senior Java developers and junior architects with specific and detailed information on how to be successful as a Java/Java EE application architect. In today’s IT departments, “architect” is a sought-after position; but only a small percentage of Java developers are able to assume the architect role for applications using Java/Java EE technologies. Most developers seeking to be architects concentrate solely on technical skills, but technical skills are not sufficient. Architects also require a blend of communication and management skills. In addition to designing Java/Java EE applications, they need to be able to document and communicate those designs to teams of developers. They must also be able to assist management so that managers can effectively coordinate developer tasks and needed resources. Finally, they must work with user representatives to help them understand how applications will be used and the functionality required of those applications. Design Java EE applications so they are robust, extensible, and easy to maintain. Document and communicate the application design so the development team’s work is targeted. Set up effective procedures and guidelines that increase stability and decrease defect reports. The book can be ordered from dvtpress.com as a print book for $34.95, or as a MOBI ebook for $9.95. The author, Derek C. Ashmore, is an architect and consultant with over 25 years of experience in a wide range of technologies, including Java and Java EE. He frequently architects and designs high-usage web applications and manages development teams to build them. Many of his articles have been published in the Java Developer’s Journal, JavaPro and other trade publications. The Java EE Architect’s Handbook is the second edition of the best-selling book The J2EE Architect’s Handbook published in 2004. It has been completely revised to incorporate the latest technologies. Note that in 2006, the term “J2EE” was deprecated and replaced with “Java Extended Edition” (Java EE).